DESCRIPTION: Palicourea rigida H.B.K, of the Rubiaceae's family, is a shrub that reaches a maximum of 3.0 m high. Occurs in central Brazil, Cerrado biome, restricted to sandy soils and rocky fields, is commonly known as beat-box, "gritadeira" or leather hat. It presents bloom from October to January, and the fructification is in February to May.Stands out in the dry savannah vegetation due strong and bright colors. The most striking appearance of this plant, no doubt, are the leathery leaves, hard as hard plastic, but the distance and first glance, seem soft and shiny. 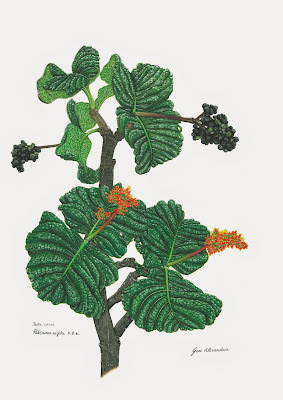 Bush scleromorphism (tortuosity) pronounced, with trunk and angular branches, leaves sessile, opposite, and highlighted ribs, leathery, shiny and flowers ranging from orange to tubuloso cup of red. Round fruit, small and vinacea color to black when ripe. Despite having medicinal properties, is being decimated because of poisoning the cattle in native and cultivated pastures.